A Jet Airways flight recently dropped 5,000 feet, garnering an emergency call from an air traffic controller. Meanwhile, the plane’s cabin was not unlike your living room on a sleepy Sunday afternoon. The Times of India’s Saurabh Sinha (h/t Daily Mail) reports a Jet Airways plane flying from Mumbai to Brussels dropped so significantly that it alerted the Ankara ATC. Thankfully, the discrepancy was quickly remedied. The odd part of the story, however, is that during the inadvertent descent, the pilot was napping and the co-pilot was busy on her tablet—much like most American households look after NFL programming. Of course, things aren’t nearly as treacherous as they sound. 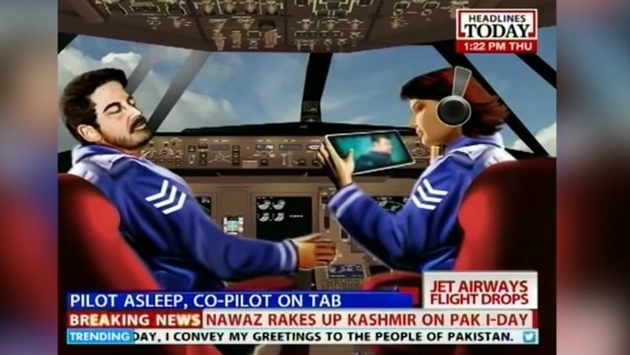 The pilot wasn’t dozing off irresponsibly, nor was the co-pilot playing Candy Crush on an iPad—at least that’s what the report infers. Sinha cites a source who spoke with the pilots and conveyed that the nap was a designed rest and the co-pilot was presumably looking at flight documents at the time. Perhaps this is much to do about little, because you would think a descent as drastic as 5,000 feet would have been noticeable to those controlling the flight let alone the passengers aboard it. Still, it’s shocking to think such a thing could occur and go unnoticed within the confines of the cabin. For the moment, the two pilots have been grounded as an investigation into the “serious incident” takes place. Thankfully, the flight’s altitude was remedied quickly in what is reportedly an increasingly congested section of airspace. As for respective cabins across the world, we understand they are relatively serene, featuring experienced pilots adept and masterful at what they do. So it makes sense that all is calm in the most important section of the plane. However, this is just too ridiculous. The only thing missing from this story would have been slippers and a cheese spread on a coffee table.